Sometime I replace chicken with pork, also taste yummy!! 1. Heat about 4tbsp cooking oil in a wok, sauté chopped garlic. 2. Add in chicken pieces and potato slices, stir fry for a while. 3. Pour light soy sauce from the side of the wok, mix and stir fry for another 1-2mins (until chicken change white). 4. Add in water, dark soy sauce, cover and simmer for about 30mins till chicken is cooked and potato turned soft and thick gravy. 5. Season with salt, drop in sesame oil before dish out. slurrpp~~Normally I'll cook dis with boneless chicken drumstick, Kids love it! Oh, I bet this is delicious! It looks very good and inviting! Yum, this looks so good...! Especially because it sounds very simple to make too! The classic Chinese dish. This beautiful dish reminds me of my mom cooking this for our dinner but sometimes she added some mushrooms to it. Oh yes, a favourite of many, including me!! Sorry I cannot spell today and I did not read it first!! My mum cooked this for us all the time when we were growing up! Long time didn't cook this dish, yours looks really good! 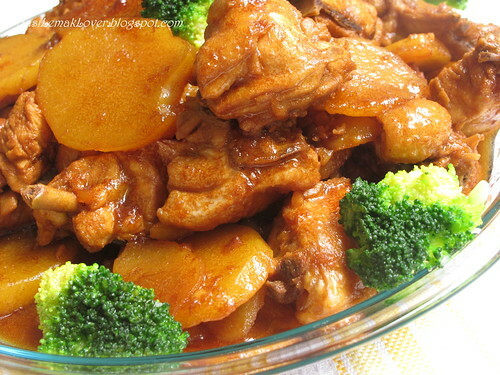 I think this should be the most "Chinese" dish of all chinese families in Malaysia! Looks delish. My mom used to cook this too! 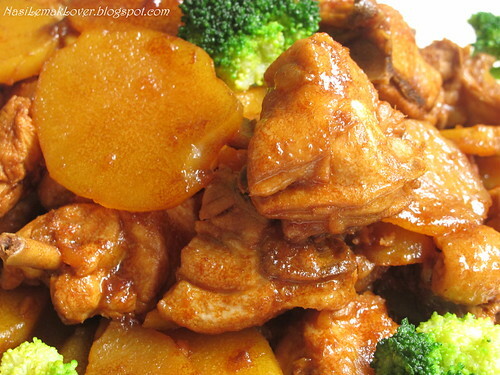 The potato would absorb all the natural sweetness of the chicken, sure taste good! Love the Combo in the stew dear! The picture is so eye-catching. I can only imagine how gorgeous the taste must be. Sonia, I love this dish, my mum used to cook it frequently but now, only upon my requested. Yours looks so delicious, wish I can have this for my dinner. Such simple ingredients, but I bet it tastes wonderful! Your blog makes me DROOL big time!!! So easy yet so tasty looking! I love it! 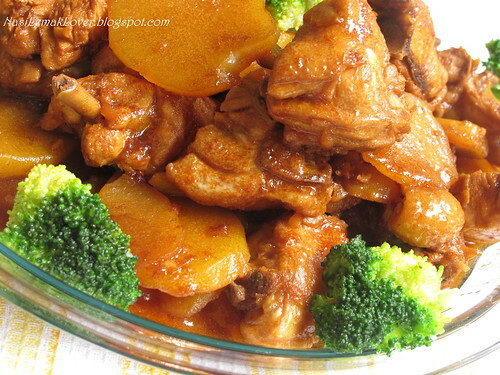 This is a yummy dish to serve with rice. Will try this out. Mmm your potato chicken stew looks nice. May try your version one day, simple ingredients! Oh.. I love this dish! It's my childhood favorite dish till now. If mum cook this for me, I'm sure got to add another bowl of rice. It's truly appetizing! I can have extra bowl of rice with this. So appetizing! I have not had this dish for a long long time. It is such a homey dish. This is a no fuss dish and yet so good and tasty! I also cook this on my lazy days!